The German edition of this manual appeared in 1979. Its main objective then was to extend help to those engaged in multiaentric therapeutic studies, especially with respect to the "Federal Government's Program on Promoting Research and Development in the Service of Health". Experience with therapeutic studies in the Federal Republic of Germany showed that considerable problems as to methods and implementation of such studies exist. The manual was an attempt to present current metho- dological knowledge and the experience obtained from completed studies in the light of the international literature. No radically new methodo- logy was produced; however, the information representing the state-of- the art, which is widely scattered up to now, has been compiled. For the American edition of this manual a few changes have been made. These concern especially the literature where references to German un- published manuscripts were omitted. The authors wish to thank Dr. Andreas Jaffe for the translation, and Evelyn Birke who typewrited the lecture-notes manuscrip~ * . GUnzburg and Munich Sibylle Biefang November 1981 Wolfgang Kopcke Martin A. Schreiber Contents Page Foreword 1. 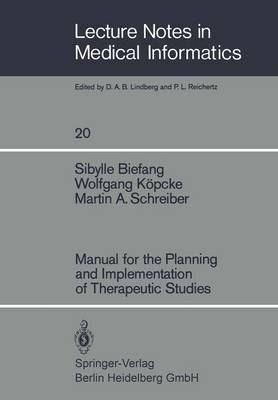 Methods of Therapeutic Studies 2 1. 1. Terminology 4 1. 2. Experimental Design 11 1. 3. Types of Studies 20 1. 4. Steps in Drug Testing 2. Checklist for the Planning, Implementation and Evaluation 22 of Therapeutic Studies 22 2. 1. Planning of Experiments 29 2. 2. Documentation 36 2. 3. Organization 41 2. 4. Statistical Analysis 44 2. 5.